Sioux Falls (/ˌsuː ˈfɔːlz/) (Lakota: Íŋyaŋ Okábleča Otȟúŋwahe; "Stone Shatter City") is the most populous city in the U.S. state of South Dakota and the 143rd-most populous city in the United States. 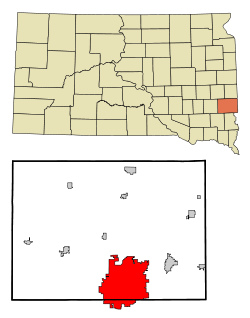 It is the county seat of Minnehaha County and also extends into Lincoln County to the south, proximate with the Minnesota state line. It is the 47th-fastest-growing city in the United States and the fastest-growing metro area in South Dakota, with a population increase of 22% between 2000 and 2010. As of 2019, Sioux Falls had an estimated population of 187,200. The metropolitan population of 259,094 accounts for 29% of South Dakota's population. It is also the primary city of the Sioux Falls-Sioux City Designated Market Area (DMA), a larger media market region that covers parts of four states and has a population of 1,043,450. Chartered in 1856 on the banks of the Big Sioux River, the city is situated in the rolling hills at the junction of Interstate 90 and Interstate 29. Two separate groups, the Dakota Land Company of St. Paul and the Western Town Company of Dubuque, Iowa organized in 1856 to claim the land around the falls, considered a promising townsite for its beauty and water power. Each laid out 320-acre (1.3 km2) claims, but worked together for mutual protection. They built a temporary barricade of turf which they dubbed "Fort Sod", in response to hostilities threatened by native tribes. Seventeen men then spent "the first winter" in Sioux Falls. The following year the population grew to near 40. Fort Dakota, a military reservation established in present-day downtown, was established in May 1865. Many former settlers gradually returned and a new wave of settlers arrived in the following years. The population grew to 593 by 1873, and a building boom was underway in that year. The Village of Sioux Falls, consisting of 1,200 acres (4.9 km2), was incorporated in 1876 and was granted a city charter by the Dakota Territorial legislature on March 3, 1883. In 1981, to take advantage of recently relaxed state usury laws, Citibank relocated its primary credit card center from New York City to Sioux Falls. Some claim that this event was the primary impetus for the increased population and job growth rates that Sioux Falls has experienced over the past quarter century. Others point out that Citibank's relocation was only part of a more general transformation of the city's economy from an industrially based one to an economy centered on health care, finance and retail trade. Sioux Falls has grown at a rapid pace since the late 1970s, with the city's population increasing from 81,000 in 1980 to 183,200 in 2018. Sioux Falls is located at 43°32'11" North, 96°43'54" West (43.536285, −96.731780). 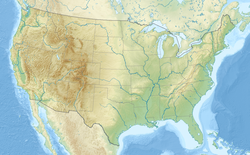 According to the United States Census Bureau, the city has a total area of 73.47 square miles (190.29 km2), of which 72.96 square miles (188.97 km2) is land and 0.51 square miles (1.32 km2) is water. 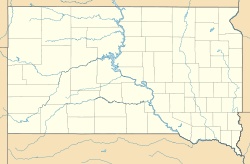 The city is in extreme eastern South Dakota, about 15 miles (24 km) west of the Minnesota border. Sioux Falls has been assigned the ZIP Codes 57101, 57103–57110, 57117–57118, 57188–57189, and 57192–57198 and the FIPS place code 59020. The Sioux Falls Metropolitan Statistical Area consists of four South Dakota counties: Lincoln, McCook, Minnehaha, and Turner. The estimated population of this MSA in 2017 was 259,094, an increase of 13.51% from the 2010 census. According to recent estimates, Lincoln County is the 16th-fastest-growing county in the United States. In addition to Sioux Falls, the metropolitan area includes Canton, Brandon, Dell Rapids, Tea, Harrisburg, Worthing, Beresford, Lennox, Hartford, Crooks, Baltic, Montrose, Salem, Renner, Rowena, Chancellor, Colton, Humboldt, Parker, Hurley, Garretson, Sherman, Corson, Viborg, Irene, and Centerville. Sioux Falls has more than 70 parks and greenways. Probably the best known is Falls Park, established around the city's namesake waterfalls on the Big Sioux River, just north of downtown. Other notable parks include Terrace Park, McKennan Park, Sherman Park, and Yankton Trail park. A popular feature of the park system is a paved 19-mile (31 km) path used for biking, jogging, and walking. The path follows the course of the Big Sioux River, forming a loop around Sioux Falls, along with a few spurs off the main bike trail. Recently the city stepped up efforts to beautify a stretch of the bike trails through downtown along an area known as the River Greenway. Two of three planned phases of construction and updates have occurred. Among the updates were newer widened bike paths, new landscaping and lighting, improved street access to the bike trails, a new interactive fountain, a new pedestrian bridge across the river, removal of the old "River Ramp" parking structure, new stepped terraces leading down to the river's edge, new retaining walls along portions of the river, and a new amphitheater/performing space. New trailheads at Elmen, Dunham, and Lien parks have helped to improve access to outlying trail spurs as well. The city is expanding the bike trail network east from Sioux Falls at Lien Park to eventually connect to Brandon, South Dakota, and ultimately the Big Sioux Recreation Area. The South Dakota Department of Game, Fish and Parks has an outdoor campus in Sioux Falls at Sertoma Park with several outdoor areas and acreages devoted to fish and wildlife. The outdoor campus hosts many outdoor activities through the year as well, including stargazing and snowshoeing. During the winter, Great Bear Recreation Park offers skiing, snowboarding, and tubing. Due to its inland location, Sioux Falls experiences a humid continental climate (Köppen Dfa) characterized by hot, relatively humid summers and cold, dry winters. It is in USDA Plant Hardiness Zone 4b. The monthly daily average temperature ranges from 16.6 °F (−8.6 °C) in January to 73.0 °F (22.8 °C) in July; there are 18 days of 90 °F (32 °C)+ highs and 26 days with sub-0 °F (−18 °C) lows annually. Snowfall occurs mostly in light to moderate amounts during the winter, totaling 44.6 inches (113 cm). Precipitation, at 26.3 inches (668 mm) annually, is concentrated in the warmer months. Extremes range from −42 °F (−41 °C) on February 9, 1899 to 110 °F (43 °C) as recently as June 21, 1988. City government: The city of Sioux Falls is led by a mayor–council (strong mayor) form of government. Mayoral elections occur every four years. City council seats are also contested every four years. Not all councilmembers are elected in the same year, as the elections are staggered throughout even-numbered years. The council consists of five members elected to represent specific sections of the city and three additional seats that represent the city as a whole (that is, at-large). The councilmember position is designed to be part-time. 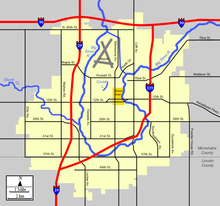 Sioux Falls operates under a home rule charter as permitted by the South Dakota constitution. 3,600 Smithfield Foods/John Morrell & Co. Originally centered on quarrying and agriculturally based industries, the economy of Sioux Falls has become diversified and more service-based over the last half-century, making the city a center of financial services, health care, and retail trade. Partially due to the lack of a state corporate income tax, Sioux Falls is home to a number of financial companies. The largest employers among these are Wells Fargo and Citigroup. Other important financial service companies in Sioux Falls include Great Western Bank, Western Surety Company (CNA Surety), Total Card Inc., Capital Card Services, Midland National Life Insurance Company, MetaBank, and First Premier Bank. Sioux Falls is a significant regional health care center. It has four major hospitals: Sanford Health (formerly Sioux Valley), Avera McKennan Hospital, the South Dakota Veterans Affairs Hospital, and the Avera Heart Hospital of South Dakota. Sanford Health and Avera Health are the largest and second-largest employers in the city, respectively. Emergency medical services (EMS) are provided by Paramedics Plus and Sioux Falls Fire Rescue. Companies based in Sioux Falls include Raven Industries, retailers Lewis Drug and Sunshine Foods, and communications companies SONIFI Solutions and Midco. In Central Downtown, shops line Phillips Avenue, and in the "EastBank" shops and restaurants fill a boardwalk style center called "8th and Railroad." "The Bridges" is an outdoor shopping center at the intersection of 57th Street and Western Avenue on the south side of the city that contains over 30 restaurants, boutiques, and private businesses. Dawley Farm Village is a major commercial development on the east side of the city at the intersection of Arrowhead Parkway (SD Highway 42) and Veterans Parkway (SD Highway 11, previously known as Powder House Road). While no longer as economically dominant as it once was, the manufacturing and food processing sector remains an important component of the economy of Sioux Falls. The Smithfield Foods/John Morrell meatpacking plant is the city's third-largest employer. Other important manufacturing companies include Orion foods systems, Wheeler Tank, Maguire Iron, Amesbury Group, Teem, Raven Industries, Bell Incorporated, Tyco International, Gage Brothers, and Rosenbauer America. The USGS Center for Earth Resources Observation and Science is approximately 10 miles north of Sioux Falls. It houses one of the largest computer complexes in the Department of the Interior. EROS has approximately 600 government and contractor employees. As of the census of 2010, there were 153,888 people, 61,707 households, and 37,462 families residing in the city. The population density was 2,109.2 inhabitants per square mile (814.4/km2). There were 66,283 housing units at an average density of 908.5 per square mile (350.8/km2). The racial makeup of the city was 86.8% White, 4.2% African American, 2.7% Native American, 1.8% Asian, 0.1% Pacific Islander, 2.0% from other races, and 2.5% from two or more races. Hispanic or Latino of any race were 4.4% of the population. There were 61,707 households of which 31.9% had children under the age of 18 living with them, 45.5% were married couples living together, 10.9% had a female householder with no husband present, 4.4% had a male householder with no wife present, and 39.3% were non-families. 30.6% of all households were made up of individuals and 8.7% had someone living alone who was 65 years of age or older. The average household size was 2.40 and the average family size was 3.02. In 2015, the median household income in Minnehaha County, SD was $59,884, while Lincoln County, SD was $76,094. This represents a 0.29% growth from the previous year. The median family income for Sioux Falls was $74,632 in 2015. Males had a median income of $40,187 versus $31,517 for females. The per capita income for the county was $26,392. 11.8% of the population and 8.5% of families are below the poverty line. Out of the total population, 16.8% of those under the age of 18 and 8.8% of those 65 and older are living below the poverty line. After statehood in 1889, South Dakota was settled mainly by European immigrants, with Germans and Scandinavians the largest ethnic groups. At present, the religious majority in the state and city is Lutheran, while Roman Catholics are the second-largest group. The Lutheran Church - Missouri Synod has 8 churches in Sioux Falls: Memorial Lutheran Church, Faith Lutheran Church, Christ Lutheran Church, Lord Of Life Lutheran Church, Our Redeemer Lutheran Church, Resurrection Lutheran Church, Zion Lutheran Church, and Trinity Lutheran Church of the Deaf. The Wisconsin Evangelical Lutheran Synod has two churches in Sioux Falls: Bethel Lutheran Church and Good Shepherd Lutheran Church. The Roman Catholic Diocese of Sioux Falls, one of two dioceses in the state, built St. Joseph Cathedral on Duluth Avenue beginning in 1915 and completed in 1919. Sioux Falls is also the seat of the Episcopal Diocese of South Dakota. Sioux Falls is home to the University of Sioux Falls, Augustana University, Sioux Falls Seminary, Southeast Technical Institute, National American University, the South Dakota School for the Deaf, the University of South Dakota's Sanford School of Medicine (Sioux Falls campus), Stewart School and the South Dakota Public Universities and Research Center (formerly known as USDSU). The Sioux Falls School District serves over 23,000 students living in Sioux Falls and some of its surrounding suburbs. Suburbs around Sioux Falls continue to experience dramatic growth as Sioux Falls expands. Suburbs experiencing rapid growth are Brandon, Valley Springs, Baltic, Garretson, West-Central, Tri-Valley, Lennox, Parker, Canton, Harrisburg, and Tea. Many of these districts serve students who live on the outer edges of Sioux Falls city limits, and serve thousands of metro-area students. The Sioux Falls School District has signed an agreement that will allow it to participate in an athletic conference known as the Metro Conference. Sioux Falls Lincoln, Washington, Roosevelt, O'Gorman and Brandon Valley High Schools will compete in this conference, potentially with other suburban districts, to help cut costs and increase competition between schools in the Sioux Falls Metro Area. In January 2019, The Sioux Falls School District board of education approved the naming and building plans of Thomas Jefferson High School. Construction will begin in 2019 and the school is scheduled to open for the 2021-22 school year. Note: Axtell Park replaced Joe Foss High School beginning fall 2014 to consolidate middle and high school alternative programs into one location. In January 2019, The Sioux Falls School District board of education approved the naming of Ben Reifel Middle School. Construction will begin in 2019 and the school is scheduled to open for the 2021-22 school year. Note: George McGovern Middle School replaced Axtell Park as one of the five primary middle schools serving Sioux Falls beginning with the 2014–15 school year. Note: Susan B. Anthony Elementary School replaced Mark Twain and Longfellow in 2016. Sonia Sotomayor Spanish Immersion elementary school is newly built and in the location of the Jefferson Elementary school building. Sioux Falls Catholic Schools is a centralized Catholic school system that includes eight schools: six elementary schools, all PreK-6 (St. Mary, St. Lambert, St. Michael-St. Katharine Drexel, Holy Spirit and Christ the King); one junior high (O'Gorman Junior High, grades 7–8); and one high school, O'Gorman (9–12). The junior and senior high O'Gorman schools are on the same campus. Approximately 2,800 students attend Sioux Falls Catholic Schools. As of the 2009–10 school year the Sioux Falls Catholic School system's St. Joseph Cathedral School was closed. The Lutheran Church-Missouri Synod operates two schools in Sioux Falls. Sioux Falls Lutheran School is on 37th street, while the Lutheran High School of Sioux Falls is on Western Avenue. In 2018, voters approved a plan to move Sioux Falls Lutheran School to a new building near the I-29/I-229 merge on south Boe Lane. The Wisconsin Evangelical Lutheran Synod has two schools in Sioux Falls: Bethel Lutheran and Good Shepherd Lutheran. Other private schools include Sioux Falls Christian Schools, Christian Center, The Baan Dek Montessori, Cornerstone School, and the Open Arms Christian Child Development Center. Downtown Sioux Falls hosts a SculptureWalk every summer. The exhibits change yearly and usually have historical significance and reflect the city's progressive standards. Downtown Sioux Falls also hosts "First Fridays." "First Fridays" are the first Friday of each summer month, and businesses and associations in the Downtown area take part in creating a major evening event. Concerts are held at the EastBank, and stores and restaurants are open with live music all along Phillips Avenue in south central Downtown. The Downtown Riverfest is an annual Sioux Falls festival that embraces the beauty of the Big Sioux. Festival of Bands is a regional competition that hosts over 40 marching bands each year from across the Midwest. The Sioux Empire Spectacular draws Drum Corps participants and fans from across the nation to Sioux Falls for a regional competition. Thousands attend the event, held at Howard Wood Memorial Field in July every summer. The event is run by DCI and the music departments of the Sioux Falls School District. Party in the Park is an annual outdoor musical event held at Terrace Park. The Sioux Empire Fair is a regional fair held at the W. H. Lyon Fairgrounds, and the Sioux Falls JazzFest is hosted at Yankton Trail Park each year. SiouxperCon is an annual nonprofit fan convention that celebrates comic books, sci-fi, fantasy, anime, board games, and video gaming. 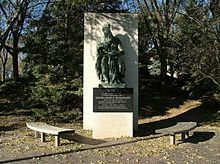 Replica of Michelangelo's Moses at Augustana University. In the beginning of the 21st century, Sioux Falls experienced a renaissance of cultural interest. The Sioux Empire Arts Council continues to lead in the Sioux Falls area arts scene and gives out Mayor's Awards each year in several categories for excellence demonstrated by Sioux Falls residents. The Sioux Falls SculptureWalk was the first visual evidence of the renaissance and is an attraction for both visitors and resident artists, hosting over 55 sculptures. One of the earliest promoters of the contemporary arts scene was Sheila Agee, who still lives in nearby Brandon. Her work was essential to the renovation of the original Washington High School into the Washington Pavilion (housing two performing arts, a visual arts, and a science center). The Northern Plains Indian Art Market (NPIAM) was established in 1988 by American Indian Services, Inc., of Sioux Falls as the Northern Plains Tribal Arts Show (NPTA). Northern Plains Tribal Arts dominated the Sioux Falls art scene from its inception in 1988. American Indian Services produced the juried art show and market from 1988 to 2003. Since 2004, Sinte Gleska University of Rosebud has been the producing organization. 2012 marked the show's 25th year. Directors have included Marilyn Lone Hill and Jack Herman. In the first 25 years of its existence—one of the longest-running Indian art shows in the country—over 800 artists from 7 northern plains states and two Canadian provinces exhibited at NPTA/NPIAM. Writers for national publications, filmmakers, and researchers have all joined the audiences over the years. Northern Plains Indian Art Market continues under the auspices of Sinte Gleska. A permanent Northern Plains Tribal Arts collection is housed in the Egger Gallery at the Washington Pavilion. Since the Washington Pavilion opened its doors to the public in 1999, this unique collection of Native American artwork has called the Visual Arts Center home. Originally the pieces were on an extended loan from American Indian Services, Inc. In 2013, thanks to many supporters, the works were acquired under the title of the Augustana Tribal Arts Collection, and now officially belong to the Visual Arts Center. A lifelong and well-respected area musician and artist, Jim Groth, became an educator when the Office of Indian Ed opened up and needed teachers for the new Native Connections classes, including his own, at Lincoln High School. He began a pit ceramics program for the students and many students working with him were able to move into the arts through the programming. The connections classes have grown to serve the city in cultural humanities and arts and Groth continues to be a leader in music in the city. Poetry and literary events began to come to greater popularity with the opening of the Sioux Empire Arts Council Horse Barn Gallery as the 21st century began (then directed by Deb Klebanoff), and due to a National Endowment for the Arts-supported Y Writer's Voice, founded and directed by Allison Hedge Coke. The Y Writer's Voice included a reading series of 38 nationally known poets and writers per year who performed works and youth workshops through the Sioux Falls Writers Voice in local performance spaces, at the YMCA after-school program, and in local schools, gaining national attention. These two entities are among a resurgence of events regularly hosted at the Washington Pavilion's Leonardo's Cafe (Lincoln High School Writer's Guild advised by SFSD Official Writer in Residence, Allison Hedge Coke, who also served on the Pavilion's Community Task Force, see Washington Pavilion Visual Arts Center – Timeline), the Sioux Empire Arts Council's Horse Barn Art Gallery, and several coffeehouses. During this renaissance, Allison Hedge Coke moved to Sioux Falls from Rapid City (shortly after winning an American Book Award), as she was serving the state of South Dakota (SDAC & ArtsCorr), first as a part-time literary artist in the Sioux Falls Schools (while still serving schools and incarcerated youth centers across the state) and then as a full-time literary artist in residence for the Sioux Falls school district (SFSD, SDAC, & Office of Indian Ed funded). She held the literary artist role with the school district while simultaneously teaching at Kilian College and the University of Sioux Falls and founding/directing a Y Writers Voice at the Sioux Falls YMCA for several years, hosting readings at the Washington Pavilion, the Dakota Conference at the Great Plains Center of Augustana College, with Deb Klebanoff at the Art Barn, in Siouxland Sioux Falls Library, in Zandbroz Bookstore, and with the Sioux Falls Multicultural Center. The Lincoln High School Creative Writers Guild and district-wide Wings Program (both advised by Hedge Coke) began holding reading performances and study periods in cafes across the city, including Leonardo's. Hedge Coke edited and published two anthologies during her tenure at Sioux Falls School District: Coming to Life: Poems of Peace in the Wake of 9/11 and They Wanted Children: Poems and Stories of Coping with Sudanese, Native, Latino, Asian, and EuroAmerican students. Hedge Coke successfully lobbied for the preservation and protection of Blood Run (now Good Earth State Park, just minutes east of town), writing the verse play during her lobbying period under an SDAC grant. She continually participated at-large in the national literary field as a visiting writer/performing artist and publishing widely while serving on the Sioux Falls Housing Board and as a city Housing Revitalization Task Member, promoting arts, civil rights, affordability and inclusion. Hedge Coke also formally proposed a Poetry Sidewalk contest for selected poems to be etched in Sioux Falls Quartzite to match the park aesthetic during city council meetings for the cleaning up and development of Falls Park and the downtown area. A version of the project is coming to fruition (in concrete, to match the Cathedral District). "Everyone deserves beauty," said Wayne Wagner, housing development director for Affordable Housing Solutions. Since the contest began in 2014, Wagner has installed poems in the sidewalk of new affordable housing within the neighborhood. Charles Luden has long been the widely accepted unofficial resident poet. Ron Robinson, a Sioux Falls writer and professor of English at Augustana College, was consistently on the scene. Steve Boint; Charles Luden; Nicole Allen; Jason Freeman; and Suzanne Sunshower's lives converged in Sioux Falls while performing poetry at Michelle's Coffee and at the Horsebarn Arts Center. Together they published From the lonely cold: poems by Nicole Allen, Charles Luden, Jason Freeman, Suzanne Sunshower, Steve Boint. Jason Freeman, poet and disability advocate was born in Sioux Falls (son of artist-writer/neurologist Jerome Freeman) and has been a part of the literary arts scene since his youth. Tom Foster moved to Sioux Falls from California, having already developed a presence in the California Slam scene, and was integral to keeping public open mics going strong. The Washington Pavilion continued to donate space for literary activities, as did the Siouxland Sioux Falls Library. Eventually, David Allan Evans returned to Sioux Falls as the State of South Dakota Poet Laureate and enhanced the literary scene. Patrick Hicks, poet/writer, came to the city to teach at Augustana College and in 2010 published the anthology A Menagerie of Words: Contemporary South Dakota Poetry. Rosalee Blunk was the initial organizer of the Poetry Out Loud state finals held annually in Sioux Falls. Maddie Lukomski, a Poetry Out Loud junior at Sioux Falls Lincoln High School was named a winner in the National Endowment for the Arts Poetry Ourselves competition spoken category in 2016. The Sioux Falls mayor's awards in literary arts designated movers and shakers during the growth and development of the literary arts scene. Deb Klebanoff, born in Sioux Falls, began the reading series at the Horse Barn with Allison Hedge Coke, after serving on the Sioux Falls Chamber of Commerce's Cultural Affairs committee, including a term as its chair and for almost a decade with the Sioux Empire Arts Council, including 8 years as its executive director. She later moved south of Sioux Falls and founded a writers' retreat, The Retreat at Pointer's Ridge. In addition to literary awards, there are mayor's awards in visual arts, performing arts, music, organizing in the arts, advocacy, and lifetime achievement, per the mayor's discretion. Many visual artists got their start in and/or represent the city, including Carl Grupp, Mary Groth, Ceca Cooper, Marian Henjum, Brad Kringen, Nancyjane Huehl, Don Hooper, Nathan Holman, Gary Hartenhoff, Sheila Agee, Mary Selvig, Martha Baker, Chad Mohr, Paul Schiller, Liz Heeren, Edward Two Eagle, Edwin Two Eagle, James Starkey, and painter/muralist Byob Mergia. The Sioux Falls Jazz and Blues Festival is a three-day outdoor musical event featuring two stages and is free to the public. It is held the third weekend in July at Yankton Trail Park. The Sioux Falls Jazz & Blues Society hosts national musicians during its annual concert series. Each year the series includes approximately five concerts with acts from all over the world. JazzFest, with over 125,000 in annual attendance, has expanded over the years to include the Jazziest Diversity Project, the All-City Jazz Ensemble, the Concert Series, and JazzFest Jazz Camp. 2016 was the festival's 25th anniversary year. The Downtown Riverfest brings live music, art, kids' activities and more in an annual festival that embraces the beauty of the Big Sioux. Downtown Sioux Falls boasts Ipso Gallery, directed by Liz Bashore Heeren, The Orpheum Theater, SculptureWalk, Sioux Empire Community Theater, Sioux Falls State Theater, The Museum of Visual Materials, The Interactive Water Fountain, Exposure Gallery and Studios, Falls Park and Cinema Falls, Creative Spirits, Eastbank Art Gallery, JAM Art and Supplies, and the Washington Pavilion, home to the South Dakota Symphony Orchestra and the occasional Poets & Painters show (P1, P2, P3, P4, P5...). Prairie Star Gallery, recently closed, was an additional American Indian Arts gallery and store. The LifeLight Music Festival is held yearly in Worthing (20 miles south) the last weekend in August. One of the largest outdoor Christian music festivals in the world, yearly attendance has continued to grow from less than 2,000 people in its first year (1998) to over 300,000 in 2013. The festival has drawn multiple performances over the years from some of biggest names in Christian music, including Skillet, Tenth Avenue North, and Remedy Drive. 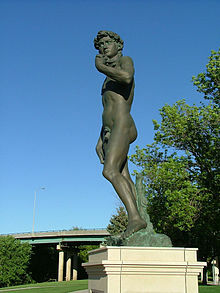 Replica of Michelangelo's David in Fawick Park. The Washington Pavilion contains the Kirby Science Discovery Center, as well as two performing arts centers that host several Broadway productions and operas. The South Dakota Symphony's home hosts dance groups as well as smaller theater and choral events. The Visual Arts Center, also part of the Pavilion complex, hosts six galleries of changing exhibits, all free of charge. The Wells Fargo Cinedome is a multiformat 60 ft (18 m) dome theater that plays several films each month. The Great Plains Zoo & Delbridge Museum provides the area with natural history and animal exhibits in its 50-acre (200,000 m2) park, and has dioramas depicting wildlife. The USS South Dakota Battleship Memorial to the World War II battleship USS South Dakota is on State Highway 42 (West 12th Street) and Kiwanis Avenue. The 114th Fighter Wing is at Joe Foss Field and houses F-16C/D fighter aircraft. The SD ANG unit is known for its support of community activities and services. Due to current and expected regional growth, several large construction projects have been or will be undertaken. New interchanges have recently been added to Interstate 29. An interchange was also completed on I-90 at Marion Road. I-29 has recently been improved from I-90 to 57th Street. This upgrade includes additional lanes and auxiliary lanes. Over the next decade, the city of Sioux Falls and the South Dakota Department of Transportation plan to construct a limited-access highway around the outer edges of the city to the south and east known as South Dakota Highway 100. This highway will start at the northern Tea exit (Exit 73 on I-29, 101st Street) and will travel east on 101st Street, and curve northeast east of Western Avenue, then turn northerly near Sycamore Avenue. The highway will end at the Timberline Avenue exit (Exit 402 on I-90). 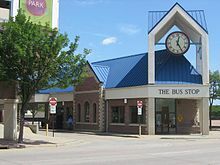 Sioux Area Metro, the local public transit organization, operates 16 bus lines within the city, with most routes operating Monday through Saturday. Recently, the city added a new transfer station in Sioux Falls on Louise Avenue between 49th and 57th Streets. The Sioux Area Metro Paratransit serves members of the community who would otherwise not be able to travel by providing door to door service. Jefferson Lines runs long-distance bus routes to Sioux Falls. Non-transfer destinations include Grand Forks, Kansas City, Minneapolis, and Omaha. Until 1965 a branch of the Milwaukee Road train from Chicago, the Arrow, made a stop in Sioux Falls. Amtrak passenger trains do not pass through South Dakota. Five domestic airlines (Delta Air Lines, United Airlines, American Airlines, Allegiant Air, and Frontier Airlines) serve Sioux Falls Regional Airport. The airport is also known as Joe Foss Field (in honor of famed aviator and former Governor Joe Foss). Airlines offer non-stop flight service to a number of major U.S. airports, including Hartsfield–Jackson Atlanta International Airport, Chicago-O'Hare International Airport, Dallas-Fort Worth International Airport, Denver International Airport, Minneapolis–Saint Paul International Airport, Orlando-Sanford International Airport, Los Angeles International Airport (seasonal), Phoenix Sky Harbor International Airport, Phoenix–Mesa Gateway Airport, Las Vegas-McCarran International Airport and Tampa-St. Pete–Clearwater International Airport. The Sioux Falls Canaries were known as the Sioux Falls Fighting Pheasants from 2010 to 2013. The Sioux Falls Canaries won the 2008 American Association championship, beating the Grand Prairie Airhogs in a 5-game series that was capped off with a 5 to 4 walk-off win in the 12th inning of Game 4. The Sioux Falls Skyforce have reached the playoffs nine times, winning the CBA Championship during the 1995–96 season, and later during the 2004–05 season. The won the 2015–16 championship in the NBA's D League, the National Basketball Association's minor league (now renamed the NBA G League), in which they currently play. The Sioux Falls Storm, currently playing in the IFL, won four consecutive championships from 2005 to 2008 in the UIF and six consecutive from 2011 to 2016 in the IFL for a total of ten titles. The Storm won 40 straight games from July 30, 2005, to March 29, 2008. They are one of four indoor/arena football teams to ever post a shutout, beating the Peoria Roughriders 72–0 in 2006. The Sioux Falls Stampede won the United States Hockey League's Anderson Cup during the 2005–6 season and two Clark Cup championships in the 2006–7 season and the 2014–2015 season. Sioux Falls has several multipurpose athletic stadiums: the primarily-baseball Sioux Falls Stadium, indoor Sioux Falls Arena, indoor Sanford Pentagon, and indoor Denny Sanford Premier Center. Sioux Falls Stadium played host to the 2007 American Association of Independent Professional Baseball all-star game. Sioux Falls Arena hosted the Continental Basketball Association all-star game in 1996, 2000 and 2003. It also hosted the NBA Development League Showcase in early 2007 and the United States Hockey League Prospects/All-Star Game in the 2002 and 2009 seasons. Constructed in 2014, the Denny Sanford Premier Center is home to The Summit League Men's Basketball Tournament and The Summit League Women's Basketball Tournament. Also The Premier Center hosted the 2017 USHL/NHL Top Prospects Game. Sioux Falls hosted the 16U Amateur Softball Association A National Championship of fastpitch softball in July 2009 and the 14U ASA A National Championship of fastpitch softball in July 2012. In August 1989 and 2009, Sioux Falls hosted the Air National Guard National Softball Tournament at Sherman Park Complex. In 2006, Men's Health magazine ranked Sioux Falls as the 93rd-angriest city in the nation, out of 100 cities studied in the survey. In 2007, Allstate awarded Sioux Falls with the Allstate Safety Leadership Award in recognition of the safe drivers of the area, with Sioux Falls residents averaging an accident once every 13.7 years. Sioux Falls was honored with the award again in 2008. In 2009, CNN ranked Sioux Falls the 45th-best place to live and launch a business out of a list of 100. Shayna Baszler – women's MMA fighter. George Botsford – composer and pianist, noted for the "Black and White Rag". Chris Browne – comic strip artist and cartoonist, Hägar the Horrible. ^ a b "US Gazetteer files 2010". United States Census Bureau. Archived from the original on January 24, 2012. Retrieved June 21, 2012. ^ a b "Metropolitan and Micropolitan Statistical Areas Population Totals: 2010-2017". 2017 Population Estimates. United States Census Bureau, Population Division. October 3, 2018. Retrieved October 3, 2018. ^ a b "Population Estimates". United States Census Bureau. Retrieved October 3, 2018. ^ "Zip Code Lookup". USPS. Archived from the original on January 1, 2008. Retrieved May 22, 2015. ^ Ullrich, Jan F. (2014). New Lakota Dictionary (2nd ed.). Bloomington, Indiana: Lakota Language Consortium. ISBN 978-0-9761082-9-0. Archived from the original on October 18, 2016. Retrieved February 13, 2014. ^ "The 258 fastest growing U.S. cities". money.cnn.com. June 27, 2007. Retrieved January 6, 2011. ^ "City Hall: 4,000 more moved to Sioux Falls in 2018". Argus Leader. Retrieved February 5, 2018. ^ "American Indian Services Inc". Archived from the original on March 4, 2008. Retrieved April 22, 2008. ^ "History of Sioux Falls". City of Sioux Falls. Archived from the original on July 5, 2008. Retrieved November 23, 2008. ^ "Ft. Dakota Virtual Tour". Angelfire.com. Retrieved March 18, 2017. ^ "Sioux Falls". Factmonster.com. Retrieved March 18, 2017. ^ "Estimates for the 100 Fastest Growing U.S. Counties in 2017: April 1, 2010 to July 1, 2017". United States Census Bureau. Retrieved October 3, 2018. ^ "USDA Plant Hardiness Zone Map". United States Department of Agriculture – Agricultural Research Service. Retrieved July 18, 2013. ^ a b "Average Weather for Sioux Falls, SD − Temperature and Precipitation". The Weather Channel. Retrieved May 14, 2010. ^ "Station Name: SD SIOUX FALLS". National Oceanic and Atmospheric Administration. Retrieved March 10, 2013. ^ "NOWData – NOAA Online Weather Data". National Oceanic and Atmospheric Administration. Retrieved February 18, 2013. ^ "Council Members". City of Sioux Falls. Retrieved May 15, 2018. ^ "2006 Action Plan Draft" (PDF). City of Sioux Falls. 2006. Archived from the original (PDF) on July 4, 2007. Retrieved March 20, 2007. ^ "2004 Presidential Election Data Graphs – South Dakota". Uselectionatlas.org. Retrieved March 23, 2007. ^ "2008 Presidential Election Data Graphs – South Dakota". Uselectionatlas.org. Retrieved October 26, 2008. ^ "Major Area Employers 2019" (PDF). Sioux Falls Argus Leader. Archived from the original on March 22, 2019. Retrieved March 22, 2019. ^ "Major Area Employers" (PDF). Sioux Falls Development Foundation. Archived from the original (PDF) on December 11, 2016. Retrieved January 27, 2016. ^ "Population and Housing Unit Estimates". Retrieved October 3, 2018. ^ "U.S. Decennial Census". Census.gov. Retrieved May 29, 2013. ^ "Bethel Evangelical Lutheran – Church and School". Sioux Falls, SD. ^ "District Overview – Sioux Falls School District". Sf.k12.sd.us. Retrieved February 11, 2019. ^ "New Sioux Falls high school will have academic 'suites,' secure outdoor space". Argus Leader. Retrieved February 11, 2019. ^ "School board unanimously votes to buy land for new middle school in southeast Sioux Falls". Argus Leader. Retrieved February 11, 2019. ^ "New Northwest High School and the Southwest Middle School Naming Committee Report EXECUTIVE SUMMARY" (PDF). Sioux Falls School District. January 28, 2019. Retrieved February 11, 2019. ^ "School - All City Elementary School (ACE)". Retrieved September 21, 2018. ^ "School - Anne Sullivan Elementary School". Retrieved September 21, 2018. ^ "School - Challenge Center School". Retrieved September 21, 2018. ^ "School - Cleveland Elementary School". Retrieved September 21, 2018. ^ "School - Discovery Elementary School". Retrieved September 21, 2018. ^ "School - Elementary Immersion Center". Retrieved September 21, 2018. ^ "School - Eugene Field A+ Elementary School". Retrieved September 21, 2018. ^ "School - Garfield Elementary School". Retrieved September 21, 2018. ^ "School - Harvey Dunn Elementary School". Retrieved September 21, 2018. ^ "School - Hawthorne Elementary School". Retrieved September 21, 2018. ^ "School - Hayward Elementary School". Retrieved September 21, 2018. ^ "School - Horace Mann Elementary School". Retrieved September 21, 2018. ^ "School - John F. Kennedy Elementary School". Retrieved September 21, 2018. ^ "School - John Harris Elementary School". Retrieved September 21, 2018. ^ "School - Laura B. Anderson Elementary School". Retrieved September 21, 2018. ^ "School - Laura Wilder Elementary School". Retrieved September 21, 2018. ^ "School - Lowell Elementary School". Retrieved September 21, 2018. ^ "School - Oscar Howe Elementary School". Retrieved September 21, 2018. ^ "School - Renberg Elementary School". Retrieved September 21, 2018. ^ "School - R. F. Pettigrew Elementary School". Retrieved September 21, 2018. ^ "School - Robert Frost Elementary School". Retrieved September 21, 2018. ^ "School - Rosa Parks Elementary School". Retrieved September 21, 2018. ^ "School - Sonia Sotomayor Spanish Immersion Elementary School". Retrieved September 21, 2018. ^ "School - Susan B. Anthony Elementary School". Retrieved September 21, 2018. ^ "School - Terry Redlin Elementary School". Retrieved September 21, 2018. ^ "School – Bethel Evangelical Lutheran". ^ "About Good Shepherd Lutheran School". ^ Clark, Jim. "SculptureWalk Sioux Falls homepage". Retrieved November 25, 2009. ^ "Mayor's Awards for the Arts". Sioux Empire Arts Council. Archived from the original on May 14, 2008. Retrieved April 22, 2008. ^ "About". SculptureWalk Sioux Falls. Retrieved March 18, 2017. ^ a b "So Much to See in Sioux Falls - Visit Sioux Falls". May 17, 2015. Archived from the original on May 17, 2015. ^ "Whatever Happened To: Art is Agee's dream come true". Argusleader.com. January 24, 2015. Retrieved March 18, 2017. ^ "About the Pavilion". Washingtonpavilion.org. January 1, 1970. Retrieved March 18, 2017. ^ "VAC: Northern Plains Tribal Art". Washingtonpavilion.org. Archived from the original on August 28, 2016. Retrieved March 18, 2017. ^ "Indian Education – Sioux Falls School District". Sf.k12.sd.us. July 14, 2016. Retrieved March 18, 2017. ^ "Jim Groth". Artscouncil.sd.gov. Retrieved March 18, 2017. ^ "Security Check Required". Facebook. Retrieved March 18, 2017. ^ a b "Allison Adelle Hedge Coke". Poetry Foundation. Retrieved March 18, 2017. ^ YMCA of the USA. "YMCA National Writer's Voice". Archived from the original on October 12, 2009. Retrieved November 25, 2009. ^ "Preparing bolo ties that will be... – Washington Pavilion Visual Arts Center". Facebook. July 27, 2016. Retrieved March 18, 2017. ^ "Good Earth State Park at Blood Run South Dakota". Expedition Oklahoma. June 14, 2014. Retrieved March 18, 2017. ^ "Allison Adelle Hedge Coke : Selected Resume" (PDF). Allisonhedgecoke.com. Retrieved March 18, 2017. ^ "Welcome to the Official Allison Adelle Hedge Coke Website". Allisonhedgecoke.com. December 20, 2013. Retrieved March 18, 2017. ^ "Allison Hedge Coke – Lannan Foundation". Lannan.org. Retrieved March 18, 2017. ^ a b c "Allison Adelle Hedge Coke : Resume". Artscouncil.sd.gov. Archived from the original (PDF) on January 3, 2017. Retrieved March 18, 2017. ^ "Allison Hedge Coke Reads from Naeem Murr's The Perfect Man – PEN America". Pen.org. April 30, 2006. Retrieved March 18, 2017. ^ "SDAAE". Blackhillsradio.com. Retrieved March 18, 2017. ^ "Allison Adelle Hedge Coke Joining the MFA in Writing & Publishing Faculty | VCFA". Vcfa.edu. Retrieved March 18, 2017. ^ "Sioux Falls Poetry Contest Set in Stone". Ksoo.com. Retrieved March 18, 2017. ^ "Charles Luden | South Dakota Festival of Books". Sdhumanities.org. Archived from the original on January 3, 2017. Retrieved March 18, 2017. ^ "Chuck Luden — South DaCola". Southdacola.com. Retrieved March 18, 2017. ^ Story and photos by Ron Robinson. "Amaranth: The Once and Future Crop?". Southdakotamagazine.com. Retrieved March 18, 2017. ^ "The Center For Western studies Newsletter" (PDF). Augie.edu. 2010. Retrieved March 18, 2017. ^ "StoryCorps: Art Huseboe and Ron Robinson | SDPB Radio". Listen.sdpb.org. August 21, 2013. Retrieved March 18, 2017. ^ "From the lonely cold : poems by Nicole Allen, Charles Luden, Jason Freeman, Suzanne Sunshower, Steve Boint (Book, 2009)". WorldCat.org. January 21, 2017. Retrieved March 18, 2017. ^ Jerome W. Freeman. Bringing Kindness to Medicine: Stories from the Prairie. Amazon.com. ASIN B00GZUD99S. ^ Freeman, Jason. "From My Limitations to Achieving the Extraordinary". On Being. Retrieved March 18, 2017. ^ "Faculty". Augie.edu. Retrieved March 18, 2017. ^ "Patrick Hicks, ed. A Harvest of Words: Contemporary South Dakota Poetry. Sioux Falls: The Center for Western Studies, Augustana College, 2010. : SUMMARY OF THE BOOK" (PDF). Library.sd.gov. Retrieved March 18, 2017. ^ "Introducing the Poetry Ourselves Winners! | NEA". Arts.gov. May 6, 2016. Retrieved March 18, 2017. ^ "Featured Artists – Sioux Falls Area Community Foundation". Sfacf.org. June 20, 2014. Retrieved March 18, 2017. ^ "Beyond SculptureWalk: Our city's art". Argusleader.com. Retrieved March 18, 2017. ^ a b "About JazzFest – Sioux Falls JazzFest 2017". Siouxfallsjazzfest.com. July 15, 2016. Retrieved March 18, 2017. ^ "Sioux Falls JazzFest 2017". Jazzfestsiouxfalls.com. July 15, 2016. Retrieved March 18, 2017. ^ "History of SFJB | Sioux Falls Jazz and Blues". Sfjb.org. August 12, 2016. Retrieved March 18, 2017. ^ "Downtown Riverfest | Downtown Sioux Falls". Dtsf.com. Archived from the original on January 3, 2017. Retrieved March 18, 2017. ^ "Ipso Gallery Presents: Boonie | Downtown Sioux Falls". Dtsf.com. June 5, 2015. Archived from the original on January 3, 2017. Retrieved March 18, 2017. ^ Great Plains Zoo & Delbridge Museum of Natural History (April 8, 2005). "Our History & Our Mission". Archived from the original on April 18, 2009. Retrieved November 25, 2009. ^ "South Dakota 100 Corridor Preservation Project". South Dakota Department of Transportation. Retrieved May 10, 2010. ^ "Sioux Falls Transit First to Deploy RouteMatch Software's Fixed Route CAD/AVL Solution". Market Wire. August 2007. Archived from the original on July 1, 2014. Retrieved October 16, 2008. ^ "Sioux Falls Regional Airport – Home". Sfairport.com. Retrieved March 18, 2017. ^ "2007 American Association All Star Game". aabfan.com. July 17, 2007. Retrieved October 16, 2008. ^ Reusse, Patrick (March 6, 2015). "Sioux Falls sports scene benefits from Sanford". Minneapolis Star Tribune. Retrieved April 4, 2015. ^ Sports KSFY (September 26, 2007). "SpitFire Suspend Operations". KSFY. Archived from the original on February 14, 2009. Retrieved October 16, 2008. ^ "Die Partnerstädte der Landeshauptstadt Potsdam". www.potsdam.de (in German). Archived from the original on June 25, 2010. Retrieved June 24, 2010. ^ Megan Raposa. "Sioux Falls Business Journal". Sioux Falls Business Journal. Retrieved March 18, 2017. ^ "How Angry Is Your City?". Health:MetroGrades. Men's Health. Archived from the original on February 14, 2009. Retrieved November 24, 2009. ^ "3rd Annual Allstate America's Best Drivers Report". Archived from the original on June 16, 2007. ^ David Broughton and Bill King (August 20, 2007). "Rounding out the top 10 markets". Street & Smith's Sports Group. Retrieved November 25, 2009. ^ McDougall, Peter (July 2, 2008). "100 best places to live and launch". CNNMoney.com. Retrieved March 10, 2009. ^ "California Literary ReviewJames Abourezk". Calitreview.com. Retrieved March 18, 2017. ^ "Shayna Baszler". sherdog.com. Retrieved September 23, 2013. ^ "Black and White Rag by George Botsford/arr. Daehn| J.W. Pepper Sheet Music". Jwpepper.com. Retrieved March 18, 2017. ^ "Chris Browne". WorldNow and KSFY. Archived from the original on September 27, 2013. Retrieved September 24, 2013. ^ "Benny Castillo". KELOLAND TV. Archived from the original on September 27, 2013. Retrieved September 24, 2013. ^ "Dallas Clark". Scripps TV Station Group. Archived from the original on September 27, 2013. Retrieved September 24, 2013. ^ "Donn Clendenon". BASEBALL REFERENCE. COM. Retrieved September 24, 2013. ^ "William Dougherty". .kdlt.com. Retrieved September 24, 2013. ^ "Joe Foss". by Acepilots.com. Retrieved September 24, 2013. ^ "Michael E. Fossum". .jsc.nasa.gov. Retrieved September 24, 2013. ^ "Neil Graff". pro-football-reference.com. Retrieved September 24, 2013. ^ a b c d Grigsby, Lutha (November 1, 1995). "Colonel Melvin Grigsby and Family" (PDF). National Grigsby Family Society Newsletter. GrigsbyFoundation.org. p. 49. ^ "Donald A. Haggar". South Dakota Legislature. Archived from the original on June 14, 2008. Retrieved September 24, 2013. ^ "Mary Hart". sdhalloffame.com. Archived from the original on September 30, 2011. Retrieved September 24, 2013. ^ "Witter Bynner Fellowships (Prizes and Fellowships, The Poetry and Literature Center at the Library of Congress)". Loc.gov. December 20, 2016. Retrieved March 18, 2017. ^ "Mike Martz". California Community College Athletic Association. Archived from the original on September 28, 2013. Retrieved September 24, 2013. ^ "Shane Van Boening". AZBilliards.com EPPA inc. Retrieved September 24, 2013. ^ "Jerry verDorn". American Media, Inc. Archived from the original on September 27, 2013. Retrieved September 24, 2013. Olson, Gary D. "Norwegian Immigrants in Early Sioux Falls: A Demographic Profile", Norwegian-American Studies, 36 (2011), pp 45–84. Oyos, Lynwood E. (2014). Reveille for Sioux Falls: A World War II Army Air Forces Technical School Changes a South Dakota City. The Center for Western Studies, Augustana College. ISBN 9780931170973. The author is Professor Emeritus of History at Augustana College. Wikimedia Commons has media related to Sioux Falls, South Dakota. Wikisource has the text of the 1911 Encyclopædia Britannica article Sioux Falls. Wikivoyage has a travel guide for Sioux Falls.